The HEART Chakra is about an unselfish, acceptance and love for others unconditionally; it's about a universal, unconditional love. The 4th chakra is the HEART chakra and the gateway to higher awareness as it's the seat of consciousness. 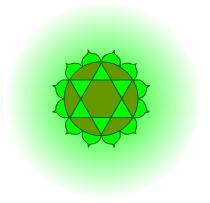 The heart chakra is the center of your personality energy field and where you begin integrating your spiritual awareness & physical experience. The ruling planet is SATURN the planet of contraction governing the pumping action of the lungs and heart. A healthy and open HEART chakra means you are in harmony with all that is around yourself and others. You are a very open, giving and loving person. You literally glow and radiate your inner peace and happiness because you understand that love involves giving selflessly, with no expectations of anything in return and that is is the greatest gift of all. Blockages in the HEART chakra mean you may fear rejection, feeling unworthy of love or loving too much. You feel unworthy of love and skeptical of anyone who wants to love you or your love relationships may be completely co-dependent. Physical Connection: The heart, blood, vagus nerve and circulatory system. Love compassion drive. Respiration.